This article was written on 28 Aug 2018, and is filled under Author: dew. I’m pretty comfortable saying that I like some not classically ‘good’ movies. I own Howard the Duck on DVD and I really dug Hell Town. I’m cool with films that are maybe a little less than cinematic masterpiece, as long as they are entertaining. 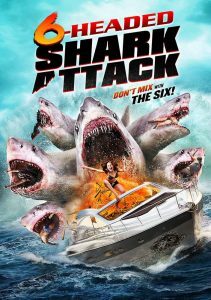 Given the huge hype surrounding the influx of terrible creature-features starring outlandish terrors from the deep (looking real hard at you, Piranhaconda), I had some vain hope that 6-Headed Shark Attack would, at the least, be somewhat amusing. The premise for 6-Headed Shark Attack sounded almost promising: four couples arrive on a tropical isle to engage in a ‘marriage boot camp’ where, through therapy and teamwork, they can work to repair their troubled relationships. Unbeknownst to them, lurking in the waters of the seemingly idyllic island paradise is a six-headed monstrosity left over from secret government experiments that had taken place on the island some forty years before. The setup alone promises some macabre fun with the horror of Jaws multiplied six times over, but the film fails to do anything but disappoint. Brandon Auret (who you may remember from such stellar films as Empire of the Sharks and Tremors 5) stars as William, the current owner of the island and proprietor of the marriage boot camp alongside his wife Suzanne (Caitlin Harty), a therapist who handles the attendees’ inner turmoil while William takes care of the physical challenges meant to bring them closer together. It might have worked, had William and Suzanne themselves not been an estranged couple, with Suzanne ready with divorce papers in hand and her new beau at her side. As it would turn out, this would be the least of William’s troubles. The couples in attendance are mostly interchangeable, remembered only for the stereotypical roles they fall into. There’s the Blondes — a couple who resemble each other closely enough to have been siblings, one a weather girl (“METEOROLOGIST!”) and the other a conspiracy-theory deep-web dudebro; Chubby Guy with Hot Wife, whose major scenes include the husband struggling to fit into a wetsuit and the wife vomiting profusely; Sexpot and her Sugar Daddy, the former of whom (of course) makes a show of having Chubby Guy attempt to help her squeeze her bountiful bosom into her wetsuit; and Professional Wife, Mary (played by Thandi Sebe, another holdover from Empire of the Sharks), and Jealous Husband, James. These two get names owing to the fact that they survive long enough that I remember them. Which reminds me: Hark, young buccaneers! Thar be spoilers ahead! So let’s unpack this. The first pieces floating corpse is found while our couples are participating in a team-building exercise to swim to an outlying float and retrieve fresh water. Of course, our valiant William is first to discover the briny bits and pieces and throw himself to the (apparently six-headed) wolves, dashing out into the water to warn his boot camp attendees of the danger; and, of course it is Mary, the pretty lawyer with the jowly jealous husband James, who should still be in the water as William swims out to save them, and the two tumble over some more displaced body parts before reaching the relative safety of the float. Cue Hot Wife vomit and ensuing panic. Everything more or less descends into madness from there as the couples and Suzanne and her boytoy are picked off one by one by the hydra-esque shark (yes, the heads do grow back). So here are all the many, many things wrong with this film. First and foremost? It’s not funny. This kind of schlock horror relies on humor to make it succeed and there is just none to be found. I think I may have passed a mild chuckle once or twice but the laughs were so forgettable that I can’t even recall what caused them. The cast seems torn between overblown performances meant to caricature film archetypes, such as Jonathan Pienaar’s tough-guy Duke, and attempting to play the material as seriously as they could. Setpieces were sparse, as to be expected on a tropical island setting, however another major flaw came in the representation of the mysterious government lab supposedly abandoned on the island. Though there was no expectation for a Deep Blue Sea style underwater sea-base, after it was talked-up by the dudebro half of the Blondes couple, the viewer probably would expect far more than what they got — which happened to be two tented rafts attached together by a plank of wood, that both (1) somehow survived forty years in the sea, and (2) were never scrapped or removed by later occupants of the island. Sure. Even the deaths were blasé, simple chomp-chomp-splatters, with the exception of the aforementioned Duke, who gets caught in a tug of war between two of the six shark heads. Ah, the shark. The shark, shark, shark, shark, shark, shark. We all know what the CGI coming out of The Asylum looks like. Namely? Not good. I’ve often rambled on about the need for more practical effects in films as of late and this is a perfect example where a physical monster might have changed the game just a little. Instead, it looked ridiculous, the varied heads bland and unremarkable. It’s all too easy to see the actors writhing on the ground, waiting for the painted-over CGI to be added to the scene. The only highlights were seeing the shark bite off one of its own damaged heads (to make room for the new one to grow, of course), and seeing the creature make its way onto land, using some of its heads in the same manner a crab would use it’s legs to skitter across the breach. Hey! I think that’s one of the things I laughed at! Long story short? There’s nothing redeemable about this film. Skip it. Now. Who do I see about getting this hour and a half of my life back?